FILE - Souvenirs are offered to tourists visiting the Amphawa floating market at Samut Songkhram province, Thailand. More than 10 percent of the country's 67 million residents are 65 or older. In Asia, the number of people older than 65 years is expected to grow from 300 million now to around 1 billion by 2050. Population experts say Asia is witnessing one of the most profound demographic shifts in recent memory, with the number of people older than 65 years expected to grow from 300 million to around 1 billion by 2050. Governments in the region are being forced to look to policy changes – in medical care, retirement ages and pension plans – to cope with the rapid demographic shift. In the admissions ward of a Bangkok public hospital, elderly patients lie on hospital gurneys awaiting admission and treatment. The routine is a daily feature of hospital life and highlights the increasing medical and social challenges Thailand is set to face with an aging population. In Thailand, over 10 percent of the 67 million population is 65 years or older. The World Bank projects that by 2040, those over 65 will number 17 million, more than a quarter of the population. Porametee Vimolsiri, secretary-general of the National Economic and Social Development Board (NESDB), a state-sector think tank, said Thailand needs to address the policy challenge of an aging population. "Compared to other Western countries, we are aging very fast. Although there are similarities to those countries who have experienced the aging situation before, in Thailand we will see [a] very fast change and during this time that we are not a high income [country], we are not rich yet, so this is quite a big issue,” said Porametee. 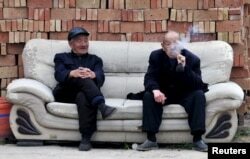 FILE - An elderly man (R) smokes a pipe as he chats with another man on a sofa in front of piles of bricks in Yongji, Shanxi province, China. In China, the government’s policy is to have 90 percent of old age care in the home, seven percent at the community level and just three percent in retirement homes. China is also facing a rapidly aging population, while Japan is reporting about 30 percent of its population is already over the age of 60. Hong Kong, Taiwan, South Korea and Singapore are witnessing similar trends. Former World Bank economist Kirida Bhaopichitr, now a research director at the Thailand Development Research Institute (TDRI), a private-sector think tank, said one outcome will be a rapid decline in labor forces for many East Asian countries. "As these countries age, the labor force fall. In Thailand, between 2010 and 2040 we look forward to labor force will fall by even more than 10 percent. In Korea it will fall by even more than 15 percent. So this group of people from 15 to 64 years of age will decline," said Kirida. Eduardo Klien, regional director for East Asia and the Pacific for HelpAge International, said the demographic change will have a profound impact on regional societies. "This demographic change is changing radically the shape of our societies. So this is the most rapid demographic change that has happened in the history of human kind, probably. Now this is a huge challenge for social and economic planners – in the macro-economy, in households, in the individual behaviors, in educational systems," said Klien. Klien said a U.N. study of Vietnam found that by 2030, the nation’s pension funds will be totally depleted. In China, the government’s policy is to have 90 percent of old age care in the home, 7 percent at the community level and just 3 percent in retirement homes. Kirida said the policy changes that need to be implemented include steps to raise fertility rates, increase female labor force participation, extend the working lives of older workers, and allow more inward immigration as well as economic restructuring to meet the challenges in the years ahead. Analysts say the Philippines, India, Cambodia and Laos are still relatively young and have only began their demographic transitions.